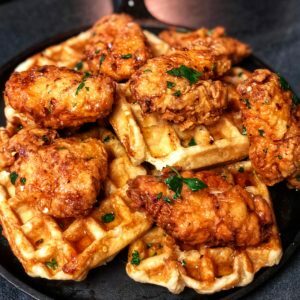 Best Chicken & Waffles Recipes - Carolina Meat & Fish Co. I suppose that now that I am living in the South, I needed to create a few Southern Recipes…be sure to check out my recipe for Fried Green Tomatoes with Pimento Cheese and my most recent recipe for Shrimp and Grits! 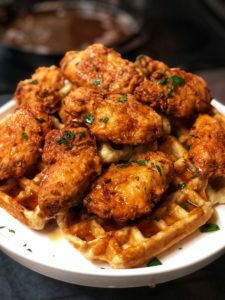 I love sweet and savory, so it is only fitting that I had to try my hand at a great recipe for Chicken and Waffles. I must admit that I do not believe that I have mad skills at making either pancakes or waffles. Given that I love to use local whenever I can, I decided to leave that part up to the experts. So I journeyed to Cast Iron Waffles and picked up a few of their amazing Belgian waffles to use in my recipe. The waffles are soft inside and have this sort of sweet, crunchy exterior, which allowed them to hold up perfectly from the heat of the chicken and the syrup. 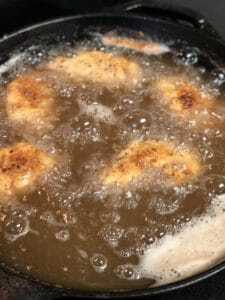 The buttermilk fried chicken recipe is my own and can be found by clicking here! 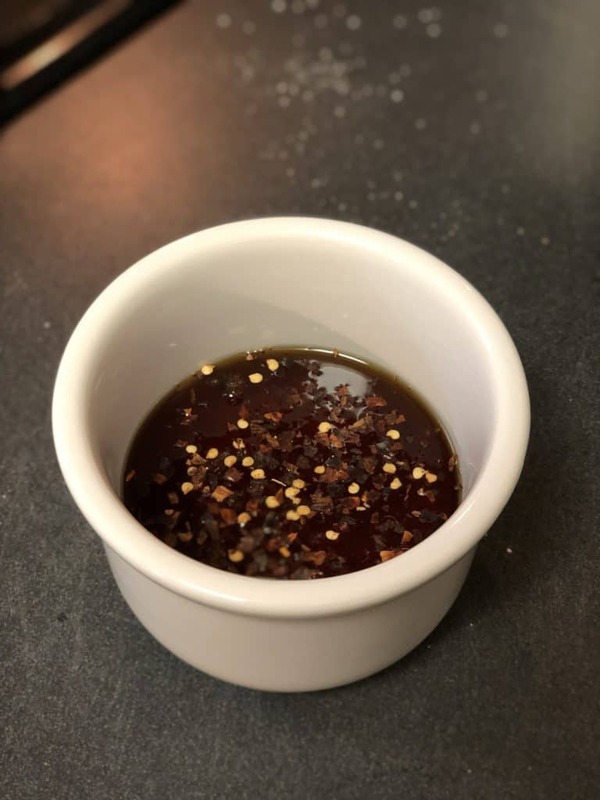 I am going to list all of the ingredients you need below…just be sure to follow my recipe on how to make the chicken…I did eliminate the celery seed for this recipe. You can definitely chose to make your own waffles. It was just so much easier for me to use a quality waffle made by experts. Warm the waffles in the oven according to directions. 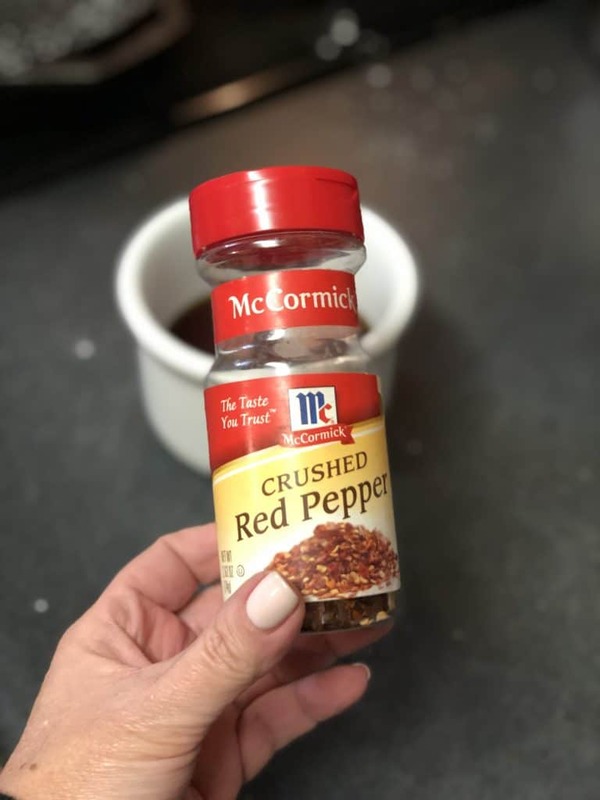 In a bowl, combine about 1 1/2 to 2 cups of the syrup and a few generous dashes of red pepper flakes. Stir and allow to sit while you prepare the chicken. 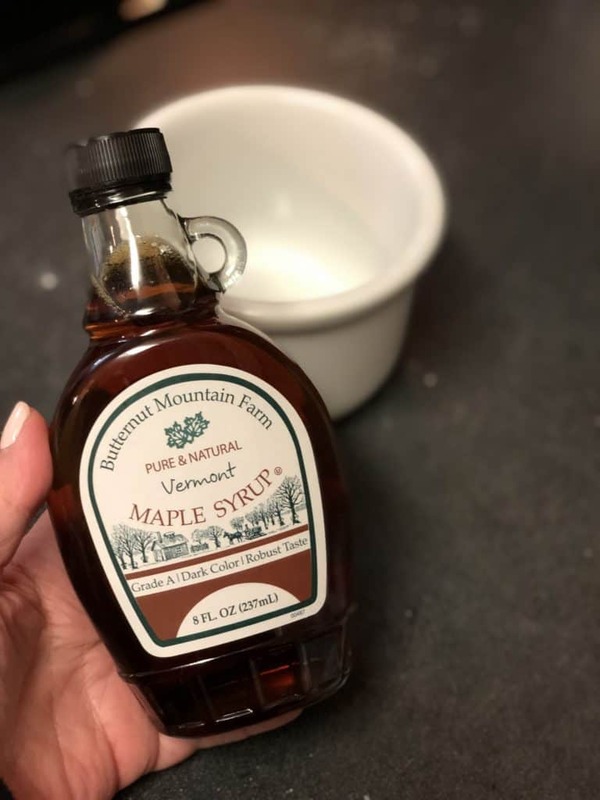 You can definitely opt out of using the red pepper flakes if you do not like heat…the addition really did level up the flavor of the syrup and rounded out this dish! Prepare your chicken. I like to allow my chicken to marinate in the buttermilk for at least 15 to 20 minutes, so time everything accordingly. 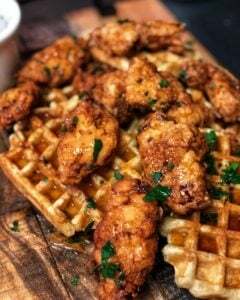 To assemble, place a waffle on a plate (I did not butter the waffle, but it is definitely an option), top with a few pieces of the chicken, drizzle with the spicy syrup (you can heat up the syrup if you like) and garnish with fresh parsley. ENJOY!